Not Drunk Enough - Blog - DARK ZODIAC NOW AVAILABLE IN MY STORE! DARK ZODIAC NOW AVAILABLE IN MY STORE! Hello!! 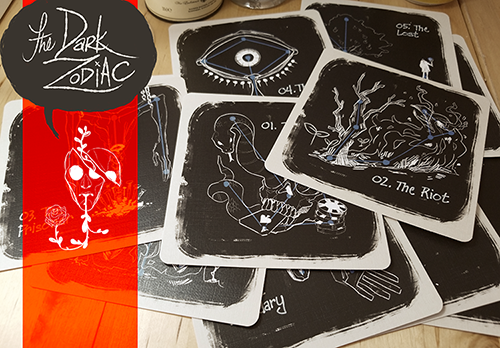 If you missed the Dark Zodiac Kickstarter, the good news is that NOW YOU CAN BUY THE SET ONLINE at my Shopify! How exciting! I am also working to make the Digital PDF available as well so you can see what the cards mean and also more about the setting of my homebrewed world of Kicker's Bluff! Thanks so much if you backed the Kickstarter for allowing me to make a large run of this, and as always, your support is amazing and wonderful! Thank you! !